Turning in your resignation isn't always easy, even if you hate your job or boss or can't wait to start a new position. Even if you are about to be fired, it can be difficult to resign tactfully. 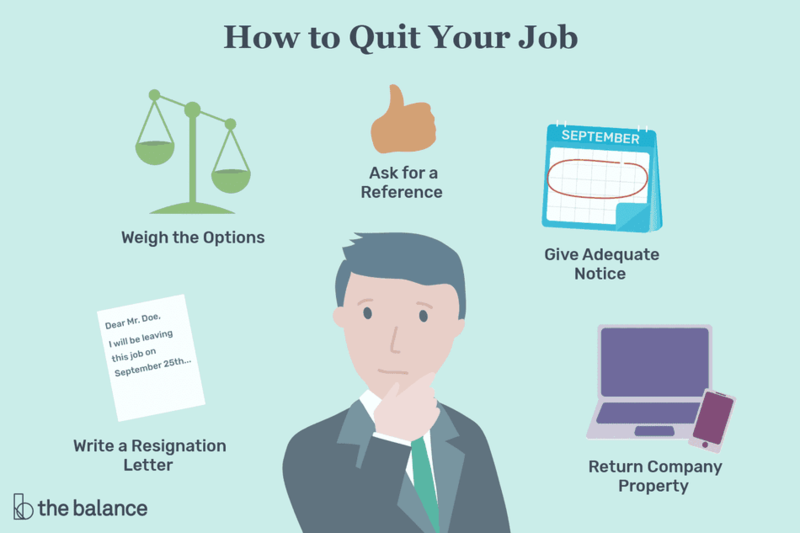 If you are considering resigning from a job, here are some important points to think through before you turn in your resignation. First of all, be sure that you really do want to quit. Here are the top warning signs that it's time to look for a new job. Also, here's a list of good (and bad) reasons for leaving your job, and a list of reasons why it might not be a good idea to quit your job right away. Make sure that you're leaving for the right reasons, rather than quitting because you're having a bad week and it seems like it won't get better any time soon. If you are certain that you want to quit, handle your resignation as carefully as you would handle any other business endeavor. It's always wise to not burn bridges. You never know when you will need your past employers for a reference. Before you make the decision to quit, be absolutely sure that this is the right decision. You don't know how long it will take for an employer to move on and fill your position if you change your mind. If you're still on the fence about the next position you are considering taking, ask if you can spend a day in the office "shadowing" the staff. It may reinforce your decision to take the position or help you decide you don't want the new job after all. Do you have another job offer? If so, weigh the pros and cons of the new position versus your current position. Consider the work environment, flexibility, salary, and benefits in addition to the job responsibilities. How about opportunities to advance? If the new job comes up ahead on all counts and you feel sure that this is the right change to make, don't hesitate. If you don't have another position lined up, consider the basics before quitting. It will take about three to six months, sometimes longer, to find a new job. Unless you quit for a good cause, you may not be eligible for unemployment benefits. Do you have enough savings or other income to manage financially? Even if your employment situation isn't the best, you might want to consider hanging on to the job you have, as well as your paycheck, and start your job search before you resign. That old saying that "it's easier to find a job when you have a job" does hold true. If you have an employment contract that states how much notice you should give, abide by it. Otherwise, it's appropriate to offer two weeks notice. However, in some cases, you may feel that you are unable to stay for another couple of weeks. The formal way to resign is to write a resignation letter and to tell your supervisor in person that you're leaving. However, depending on circumstances, you may need to quit over the phone or to quit via email. Regardless of how you resign, write a resignation letter. A resignation letter can help you maintain a positive relationship with your old employer, while paving the way for you to move on. You never know when you might need that old employer to give you a reference, so it makes sense to take the time to write a polished and professional resignation letter. Don't say much more than you are leaving. Emphasize the positive and talk about how the company has benefited you, but also mention that it's time to move on. Offer to help during the transition and afterward. Don't be negative. There's no point - you're leaving and you want to leave on good terms. Here are tips on what to say when you quit your job and here's a list of reasons for leaving a job to review. Also, do your best to not put your foot in your mouth. Be prepared, as well, to handle an exit interview. Before you leave, ask for a letter of recommendation from your manager. As time passes and people move on, it's easy to lose track of previous employers. With a letter in hand or a LinkedIn recommendation online, you'll have documentation of your credentials to share with prospective employers. You may be asked to participate in an exit interview prior to your departure. Review sample exit interview questions to get an idea of what you'll be asked during an exit interview. Return any company property you have - including keys, documents, computers, phones, and anything else that doesn't belong to you. The company doesn't want to chase you to get it back, and you don't want to be held responsible if it's not returned in a timely manner. Before you turn in your resignation, review these resignation do's and don'ts and resign as gracefully as possible.